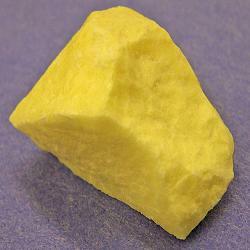 BEAUTIFUL BRIGHT YELLOW SULFER NUGGET. CAN EASILY BE CRACKED TO OBTAIN SMALLER PIECES. A REALLY UNIQUE COLOR. NUGGETS ARE APPROXIMATELY 1" IN SIZE.